Purpose: The purpose of this study was to determine the extent of ultrasonic scaling instrumentation instruction in dental hygiene programs in the U.S. Currently, there is no publication available defining a consensus of instruction for ultrasonic instrumentation. Methods: Exempt status was received from the West Virginia University Institutional Review Board. A survey was developed with dental hygiene administrators and faculty, based on assumptions and a list of questions to be answered. The survey was tested for validity and revised after feedback from additional faculty. The instrument was 64 questions divided into demographics, curriculum and equipment. Most questions included a text box for additional comments. An email survey was sent to all directors of accredited dental hygiene programs in the U.S. (n=323). The final possible number of respondents was n=301. Results were collected in aggregate through the Secure Online Environment (SOLE). Results were transferred to an Excel spreadsheet for statistical analysis. Results: After 3 emails, the response rate was 45% (n=136). No significant differences in methods of instruction were found between associate and baccalaureate degree granting programs. Eighty-nine percent of programs introduce hand scaling prior to ultrasonic scaling instruction. Students in 96% of the programs were required to administer pre-procedural mouth rinse intended to reduce the amount of bacteria. The magnetostrictive ultrasonic scaler is widely used in dental hygiene instruction. A variety of inserts/ tips were available although a universal or straight insert/tip was most common. Calculus, not inflammation, was the primary criterion for ultrasonic scaler use. Conclusion: The results of this study demonstrate that ultrasonic instrumentation is an integral component of the clinical curriculum and the majority of the dental hygiene programs prescribe to similar teaching methods. Programs could benefit from incorporating current scientific research findings of using site specific inserts to perform periodontal debridement based on thorough biofilm removal measured by resolution of inflammation. Based on the Commission on Dental Accreditation (CODA) Dental Hygiene Standards, dental hygiene programs would be expected to teach content on the theory for periodontal therapy that is current and evidence-based which would include ultrasonic instrumentation. Instruction would include the therapeutic mechanism of the ultrasonic action, ultrasonic instrumentation technique including the adaptation of various inserts in relation to tooth morphology, the rationale and criteria for use of inserts, infection control, and the application of these principles through actual clinical experience. Development of a clinical competency measure of student proficiency using an ultrasonic scaler throughout the clinical experience would be expected.6 The information provided by this study could assist in reevaluating portions of ultrasonic curriculum while validating other segments of instruction, thereby establishing consistency of theory and practice. In 1993, the term “debridement” was introduced to dental hygiene students by Irene Woodall. Debridement advocated the treatment of the root surface, the pocket space and the pocket wall to promote healing.5,8,9,11,17-20 This recognized and addressed the need for elimination of pathogens and tissue response instead of only calculus removal for the treatment of periodontal inflammation. In contrast, the focus of root planing was on deposit removal and a glassy smooth root surface, not the reduction of pathogens. Specialized insert tips are available. A beavertail tip has a wide working end, ideal for removing thick tobacco stains, orthodontic cement and tenacious calculus. Site-specific inserts can have a right or left curved shank or a shank with a number of backbends, all designed to enhance adaptability to the root anatomy of the teeth. Tips wear as a result of use, resulting in loss of effectiveness. One millimeter of tip wear will result in approximately 25% loss of efficiency.4,5 Two millimeters of wear will result in approximately 50% loss of efficiency, and replacement would be required.4,5 Wear guides can be obtained from the manufacturer. Investigators have reported that ultrasonic scalers release bacteria-laden aerosol into the environment creating a biohazard.3-5,7,16,32-37 Microorganisms can remain suspended for at least 30 minutes and up to 24 hours.4,7,33 The area of exposure can be up to 20 feet from the treatment center. Having the patient rinse with an antimicrobial mouth rinse prior to treatment decreased the amount of bacteria in the mouth to be released into the air.4,32-36,38 High-speed evacuation captured the excess water which significantly decreased the amount of bacteria-laden aerosol released into the air.32-37 Studies showed that blood is present in the aerosols produced by ultrasonic scalers even though it is not visible.10,35-37 The standard salvia ejector cannot capture aerosols adequately.10,37 Adaptors added to the high-speed evacuation are available and would make it easier for the clinician to use the high-speed evacuation without assistance.32,33 Proper cleaning of the operatory surfaces would be necessary due to the contamination by the aerosols produced by ultrasonic scalers. Historically, cardiac pacemakers were considered a contraindication for the use of ultrasonic scalers. Pacemakers are shielded; therefore, the magnetostrictive ultrasonic electromagnetic field will pose no risk to a patient with a modern cardiac pacemaker.39-41 The piezoelectric ultrasonic scaler did not produce an electromagnetic field. The purpose of this study was to assess the level of ultrasonic instrumentation instruction employed in dental hygiene educational programs in the U.S. Currently, there is no publication available defining the current consensus of teaching methods for ultrasonic instrumentation in dental hygiene programs in the U.S.
Exempt status was received from the West Virginia University Institutional Review Board. A survey was developed with dental hygiene administrators and faculty of West Virginia University. The survey was tested for validity, using additional faculty to review the survey and revised after feedback. The instrument consisted of 64 questions asking about demographics, curriculum and equipment. Most questions included a text box for additional comments. An email survey was sent to all directors of accredited dental hygiene programs in the U.S. (n=323). The West Virginia University Secure Online Environment (SOLE) system was utilized for the email survey. A total of 3 emails were sent. Email addresses were obtained from The American Dental Education Association Directory of Institutional Members. Most questions allowed for more than one answer to be selected, therefore totals did not equal 100% for every question. After the first email, 22 subjects were eliminated for various reasons, including 3 programs without onsite student clinics, 2 program directors who stated they did not answer surveys, 1 director who responded that the program was too new, no email could be found for 1 program, 11 emails bounced back, and 4 automatic responses stated out of the office until fall (n=301). After 3 emails, the response rate was 45% (n=136). Results were collected in aggregate through SOLE and transferred to an Excel spreadsheet for statistical analysis. Demographically, the programs were divided into 4 regions: Northeast, South, Midwest and West, using a regional designation employed by the U.S. Census. The response rate was the least from the northeast states (8.1%) and the greatest response rate was from the Midwest states (38.2%). There was no significant difference in the response rate between programs conferring associate degrees or bachelor degrees. Pre-clinical instrumentation was introduced by 86% of the dental hygiene programs in the first term, with 26% including ultrasonic scaling instruction during the pre-clinical instrumentation course. No difference was noted between programs conferring an associate degree and programs conferring a bachelors degree. 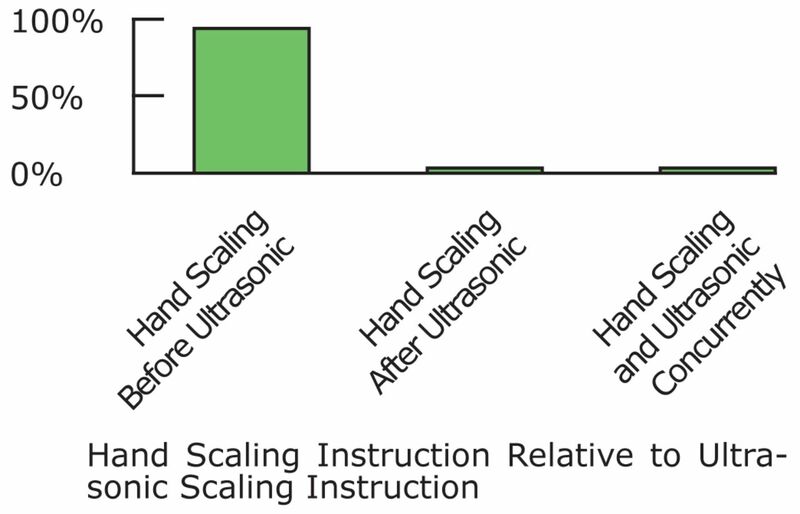 The majority of programs (89.2%) introduced hand scaling instrumentation instruction prior to the introduction of ultrasonic scaling instrumentation instruction (Figure 1). 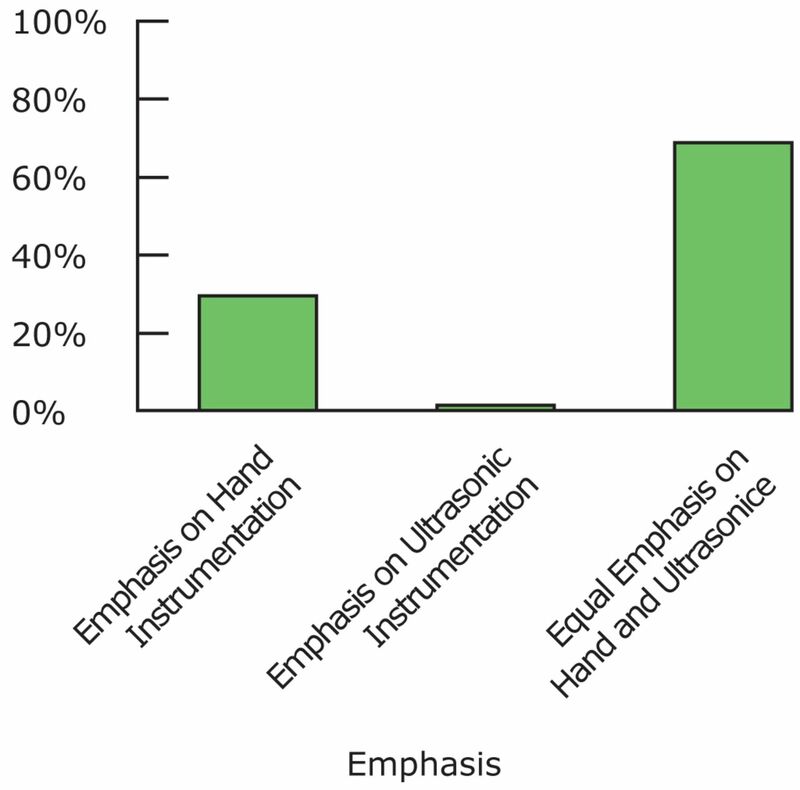 Sixty nine percent of respondents reported that equal emphasis was placed on hand scaling instrumentation and ultrasonic scaling instrumentation (Figure 2). Use of teaching strategies was explored (Figure 3). The most common strategy for teaching was the use of typodonts. 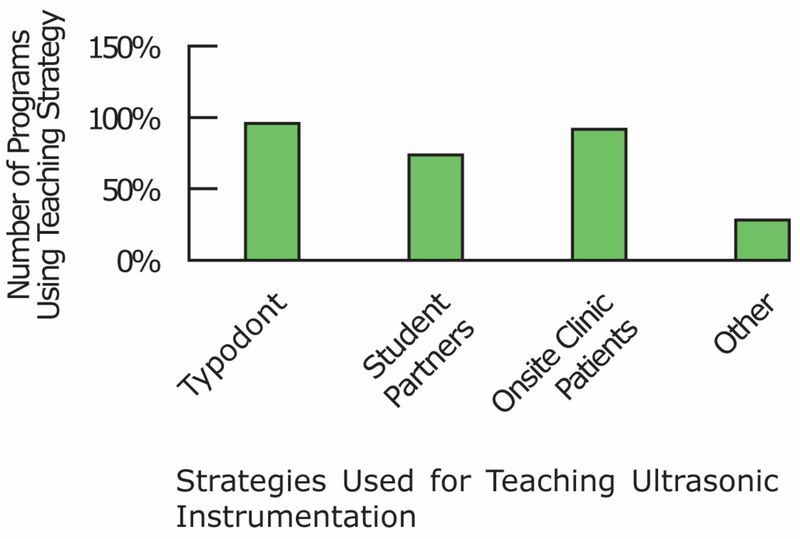 Other teaching strategies included student partners (89%) and onsite clinical patients (83%). Ultrasonic insert tip adaptation techniques taught in the program were also assessed. Five choices were provided (oblique, modified oblique, vertical, furcation adaptation and other). The 2 most common techniques were the oblique using the lateral insert surface (91%) and vertical strokes working parallel to the tooth similar to a probe (91%). Also taught was the modified oblique using the face and back of the insert (84%), followed by furcation adaptation (41%). When asked about criterion for use of the ultrasonic scaler, 77% used the amount of calculus as a criterion. Stain was a criterion by 50% and degree of inflammation was reported by 31%. The study asked about the prevalence of the 2 most common types of ultrasonic scalers. Magnetostrictive ultrasonic scalers were much more prevalent than piezoelectric ultrasonic scalers in dental hygiene programs and were reported to be used in 93% of the dental hygiene programs who responded. The majority of programs (80%) indicated that the ratio of magnetostrictive ultrasonic units to students was predominantly 1:1. Six programs (5%) required students to purchase their own magnetostrictive ultrasonic scaler unit. Most programs (72%) required students to purchase ultrasonic scaler inserts while enrolled in the dental hygiene program. Figure 4 notes the magnetostrictive inserts students were required to purchase and which inserts were provided by the program. The slim diameter straight tip was the most common choice of tip. Sixty nine percent of programs (n=94) reported having piezoelectric ultrasonic scalers. Only 10 programs had a higher than a 1:5 ratio of piezoelectric ultrasonic scalers to students. Most reported using them for demonstration purposes. 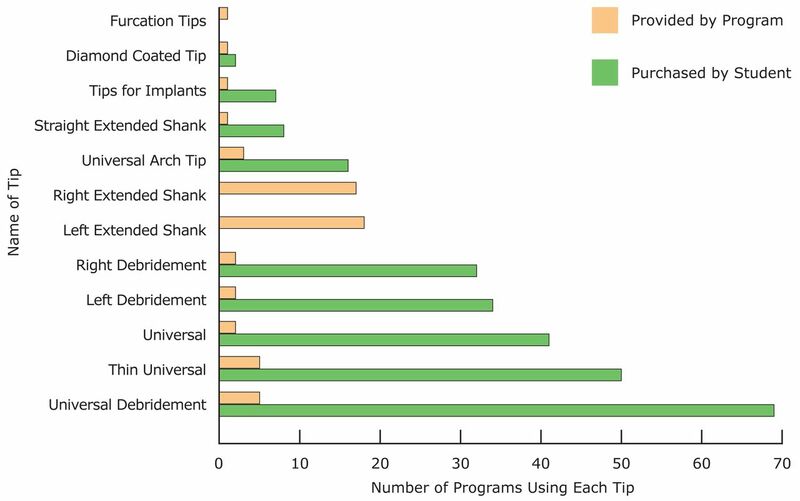 Most programs (69%) utilizing piezoelectric ultrasonic scalers provided the tips for students to use. The diamond coated tip was used with supervision (Figure 5). 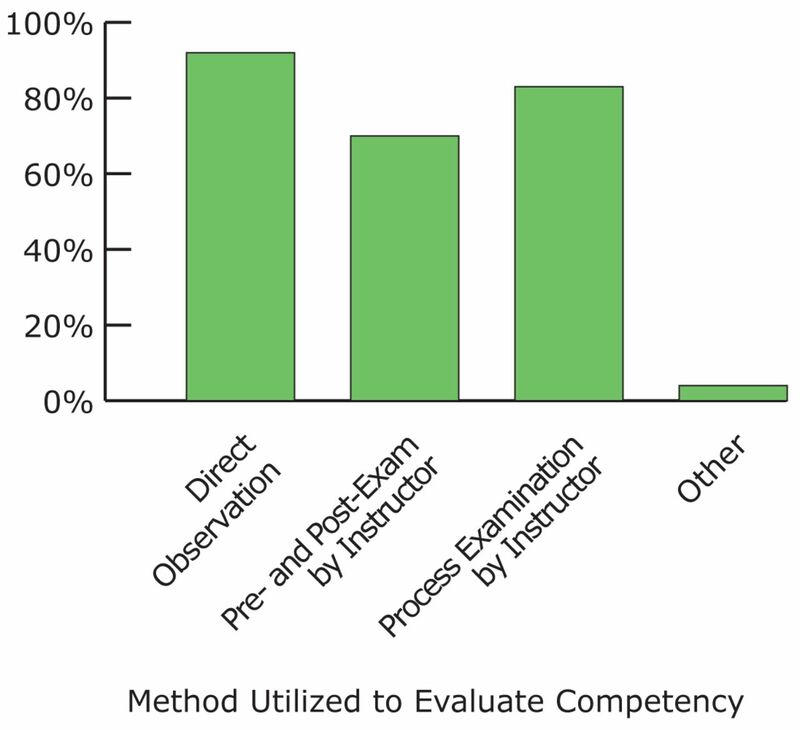 The majority (90%) incorporated more than one type of competency assessment for ultrasonic instrumentation (Figure 6). Methods included direct observation, pre- and post-exam by instructor and process examination by instructor. 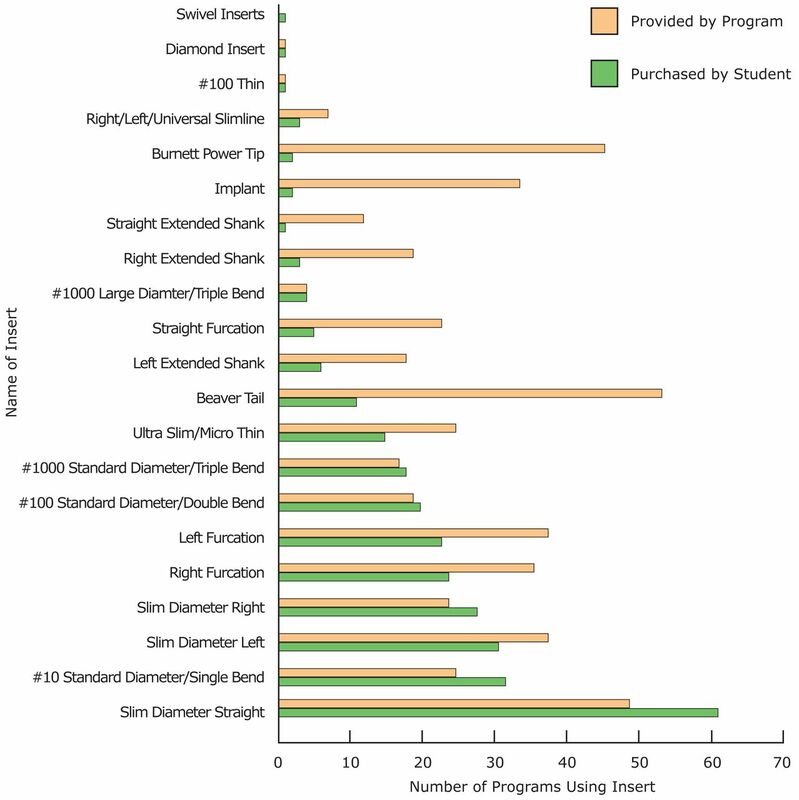 Six programs (5%) used additional methods including critical thinking narratives that included determination of instrument selection, techniques used and identification of correct treatment modalities for specific patients. Skill evaluation, self-evaluation and a written exam were utilized for competency assessment. Most programs (97.82%) cite calculus as a criterion for using the ultrasonic scaler, with 31% indicating inflammation as a criterion for ultrasonic debridement. This suggests that dental hygiene programs are still teaching a traditional approach to instrumentation. However, respondents agree that most patients benefit from the use of the ultrasonic scaler. Programs should reevaluate the criteria used to determine the need for ultrasonic instrumentation utilizing evidence-based and current philosophies of periodontal therapy that recognizes the key role of inflammation. Considering the vast amount of evidence implicating biofilm as the etiological factor for periodontal disease rather than calculus, the current survey revealed that a traditional teaching approach is utilized by most dental hygiene programs.2,5,9,11,14,15,17 Traditionally, instrumentation has been approached based on the presence of clinically-detectable calculus deposits, with the end point of therapy measured by the absence of clinically-detectable deposits. An approach that aligns with the current treatment philosophy of periodontal debridement would be based on thorough removal of biofilm in addition to calculus, with the end point of therapy measured by resolution or absence of inflammation.2,5,9,11,14,15,17 The findings of this study indicate a disconnect between what is written in scientific literature and what is actually practiced in dental hygiene programs. Dental hygiene programs in the U.S. universally embrace teaching ultrasonic instrumentation, and encourage ultrasonic use on all patient profiles. The majority of programs recognize the need for a pre-procedural mouth rinse, and the use of high volume evacuation to reduce the bacteria laden aerosol produced. Almost all programs cited calculus removal as the criterion for using the ultrasonic scaler. The results of this survey suggests that the teaching of instrumentation is not fully aligned with current treatment philosophy of periodontal debridement based on the need for thorough removal of biofilm using site specific inserts, with the end point of therapy measured by resolution or absence of inflammation. Sharon Stemple Hinchman, RDH, MSDH, graduated from West Virginia University in 2011 with a Master of Science in Dental Hygiene. Amy Funk, BSDH, MSDH, is Director, Division of Dental Hygiene, Department of Periodontics, School of Dentistry, West Virginia University. Christina DeBiase, BSDH, EdD, is an Associate Dean for Academic and Postdoctoral Affairs, School of Dentistry, West Virginia University. Cathryn Frere, BSDH, MSEd, was previously affiliated with West Virginia University and is now retired.
. The application of the ultrasonic dental unit to scaling procedures. J Periodontol. 1957;28:264-271.
. Ultrasonics for periodontal therapy. Access. 2010;24:40-42.
. Mechano-physical and biophysical properties of power-driven scalers: Driving the future of powered instrument design and evaluation. Periodontol 2000. 2009;51:63-78.
. Fundamentals of Periodontal Instrumentation. Baltimore: Lippincott; 2008. 538-565 p.
. Ultrasonics. Access. 1999;22(Special Suppl):2-9.
. Position paper: Sonic and ultrasonic scalers in periodontics. J Periodontol. 2000:71;1792-1801.
. The assessment of ultrasonic root surface debridement by determination of residual endotoxin levels. J Clin Periodontol. 1990;17(2):174-178.
. Microbes, inflammation, scaling, and root planing, and the periodontal condition. J Dent Hyg. 2008;82 (Suppl 3):4-9.
. Sonic and ultrasonic scalers in periodontal treatment: A review. Int J Dent Hyg. 2007;5:2-12.
. The role of dental plaque biofilm in oral health. J Dent Hyg. 2007;81(5):1-12.
. Dental plaque removal by cavitational activity during ultrasonic scaling. J Clin Periodontol. 1988;15:539-543.
. The effect of subgingival debridement with hand and ultrasonic instruments on the subgingival microflora. J Clin Periodontol. 1987;14:528-533.
. Dental biofilms in the oral cavity. Dimensions. 2011:6-22.
. Nonsurgical approaches for the treatment of periodontal diseases. Dent Clin N Am. 2005;49:611-636.
. Sonic and ultrasonic scaler in periodontics. J Periodontol. 2000;71:1792-1801.
. Periodontal debridement: Still the treatment of choice. J Evidence-Based Dent Pract. 2014;14:33-41.
. Penetration depths with an ultrasonic mini insert compared with a conventional curette in patients with periodontitis and in periodontal maintenance. J Clin Periodontol. 2008;35:31-36.
. An in vitro study of various instruments for root planing. Int J Periodont Restorat Dent. 1997;17(6):592-599.
. Periodontal debridement. In: Woodall IR: Comprehensive Dental Hygiene Care. St. Louis (IL): Mosby-Year Book, Inc.; 1993. 533-570 p.
. A systematic review of efficacy of machine-driven and manual subgingival debridement in the treatment of chronic periodontitis. J Clin Periodontol. 2002;29(Suppl s3):72-81.
. Advances in power driven pocket/root instrumentation. J Clin Periodontol. 2008;35:22-28.
. A comparison of effectiveness of hand scaling and ultrasonic debridement in furcations as evaluated by differential dark-field microsocopy. J Periodontol. 1987;58:86-94.
. Nonsurgical periodontal therapy in 2000: A literature review. J Am Dent Assoc. 2000;31(11):1580-1592.
. Comparative effectiveness of hand and ultrasonic instrumentations in root surface planing in vitro. J Clin Periodontol. 2004;31:160-165.
. Efficacy of an ultrasonic scaler with a periodontal probe-type tip in deep periodontal pockets. Adv Dent Rest. 1988;2(2):405-410.
. Single-visit, full-mouth ultrasonic debridement: A paradigm shift in periodontal therapy? J Clin Periodontol. 2005;32:732-733.
. Effect of instrument power setting during ultrasonic scaling upon treatment outcome. J Periodontol. 1996;66(9):756-760.
. Focus on ultrasonic inserts and tips. Dimensions. 2011;9(7):42.
. The pathway to synergy. Dimensions. 2008;6(7):24-26.
. Clinical Practice of the Dental Hygienist. Philadelphia: Lippincott; 2013. 621-629 p.
. Ultrasonic dental scaler: Associated hazards. J Clin Periodontol. 2003;30(3):95-101.
. Efficacy of preprocedural rinsing with an antiseptic in reducing viable bacteria in dental aerosols. J Periodontol. 1992;63(10):821-824.
. Blood contamination of the aerosols produced by in vivo use of ultrasonic scalers. J Periodontol. 1998;69(4):434-438.
. The effectiveness of an aerosol reduction device for ultrasonic scalers. J Periodontol. 1999;70(1):473-477.
. Aerosol and splatter contamination from the operative site during ultrasonic scaling. J Am Dent Assoc. 1998;129(9):1241-1249.